INTERNATIONAL STUDENT EMPLOYMENT WORKSHOP POST-COMPLETION OPTIONAL PRACTICAL TRAINING Patricia LauschInternational Student and Scholar Services and Advising. 2 Optional practical training (OPT)  What does OPT mean?  “Optional Practical Training is temporary employment for the purpose of practical training directly related to the student's major area of study”  What does Post-Completion OPT mean?  OPT performed after the student's program end date  An F-1 student may apply for post-completion OPT up to 90 days before the student's program end date and up to 60 days after his or her program end date. 3 Work Done for OPT  Work done for OPT MUST be “directly related to the student's major area of study”.  SEVP recommends that the student maintain evidence for each job documenting the position held, proof of the duration of that position, the job title, contact information for the student's supervisor or manager, and a description of the work. 4 Standard OPT  Standard OPT can be authorized for a maximum aggregate period of 12 months per educational level. A student becomes eligible for another 12 months of practical training when he or she changes to a higher educational level.  Although students may engage in both pre-completion and standard post-completion OPT, the maximum amount of time that can be granted for all standard OPT combined is 12 months per educational level. 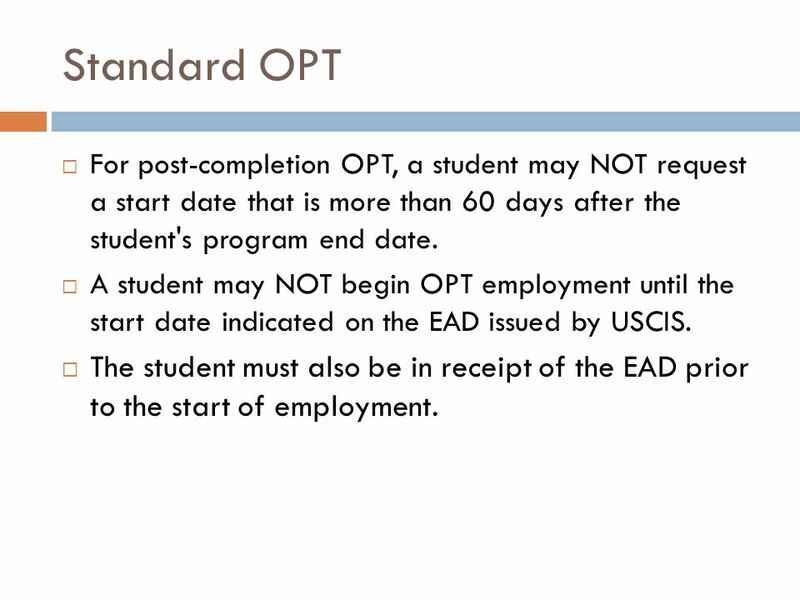 5 Standard OPT  For post-completion OPT, a student may NOT request a start date that is more than 60 days after the student's program end date.  A student may NOT begin OPT employment until the start date indicated on the EAD issued by USCIS.  The student must also be in receipt of the EAD prior to the start of employment. 6 STEM Extension  F-1 students approved for standard post-completion Optional Practical Training based on a bachelor's, master's, or doctoral degree in a STEM (science, technology, engineering, mathematics) field that appears on the DHS STEM-Designated Degree Program List may apply to USCIS for a one-time 17-month extension of post-completion OPT (for a total eligibility of up to 29 months). 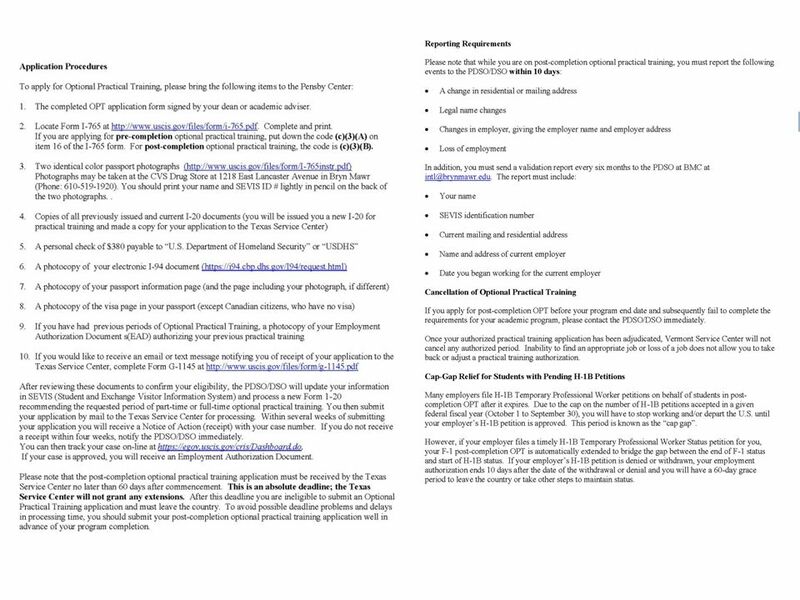 DHS STEM-Designated Degree Program List  To be eligible for the extension, the student's employer must be registered in E-Verify and must agree to report to the DSO when the student is terminated or leaves employment. 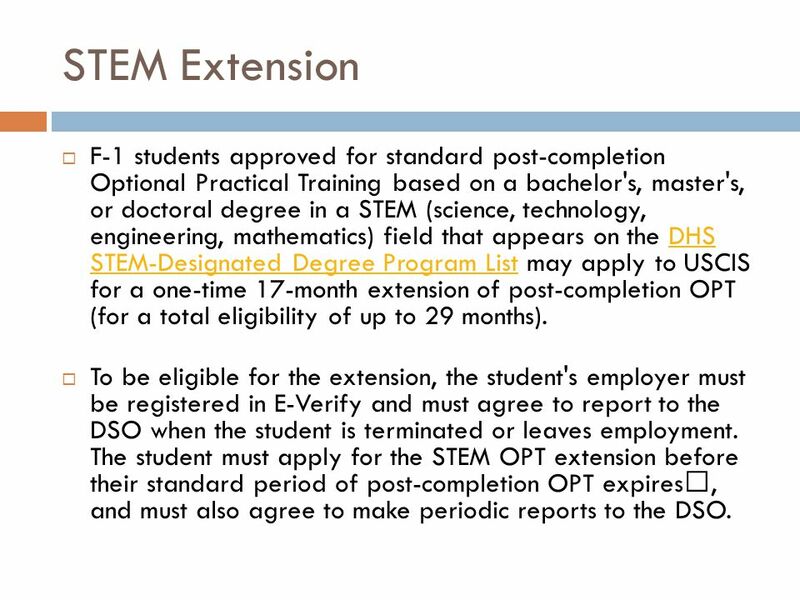 The student must apply for the STEM OPT extension before their standard period of post-completion OPT expires, and must also agree to make periodic reports to the DSO. 7 OPT Application Form What does it look like? 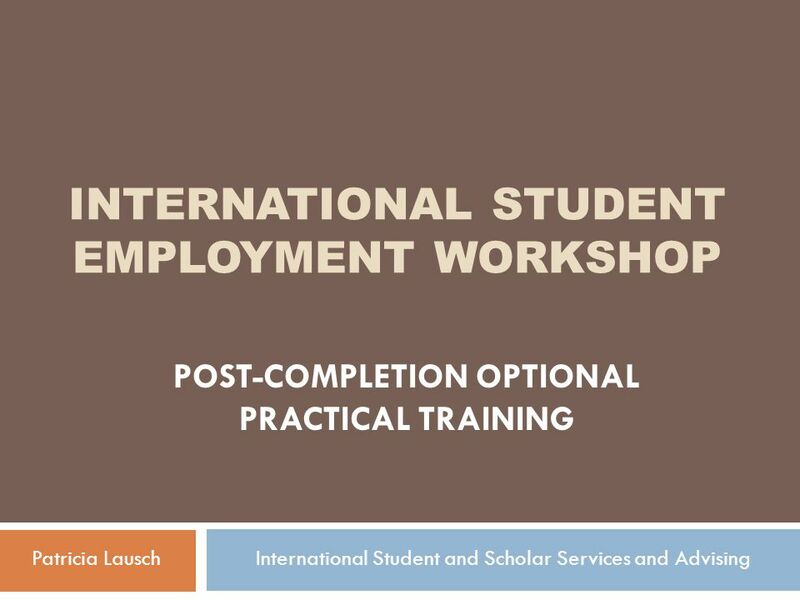 Download ppt "INTERNATIONAL STUDENT EMPLOYMENT WORKSHOP POST-COMPLETION OPTIONAL PRACTICAL TRAINING Patricia LauschInternational Student and Scholar Services and Advising." Work Authorization for F-1 & J-1 Students. Maintaining statusMaintaining status F1 Practical TrainingF1 Practical Training J-1 Academic TrainingJ-1 Academic. 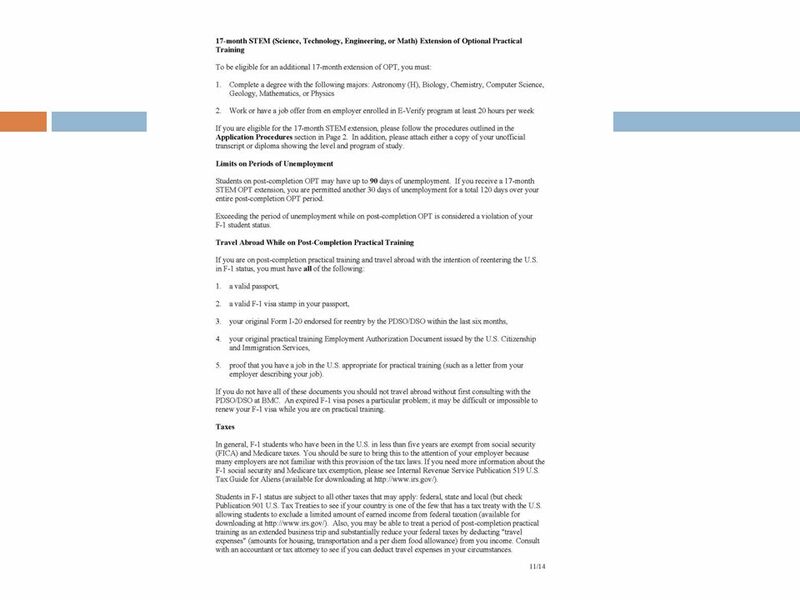 Guide to applying for Optional Practical Training (OPT) Graduating? Getting a job? 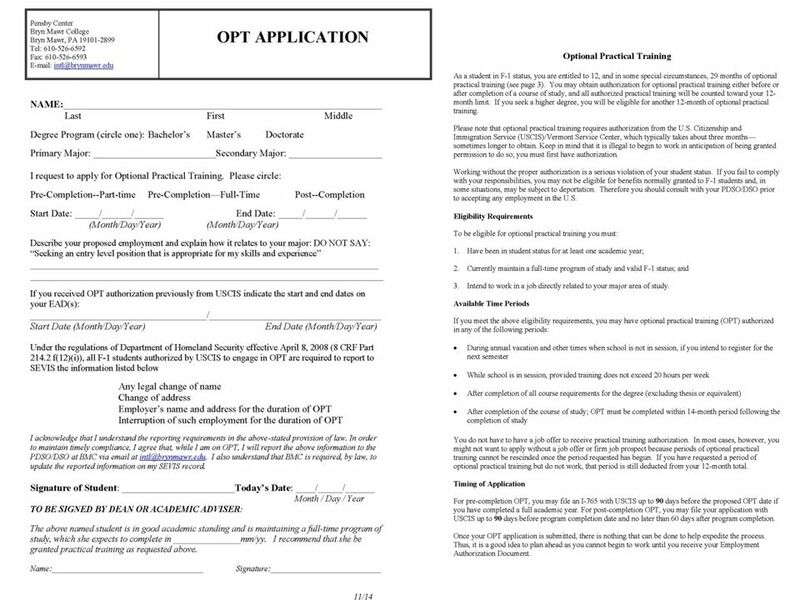 YOU need to apply for OPT! Hersh Sisodia. Your Official Source on U.S. Higher Education EducationUSA.state.gov Fanta Aw American University Overview of Employment Options for F-1 and J-1 Students. Learning with Purpose Optional Practical Training (OPT) F-1 Students Off-Campus work in field of study. 12 months of OPT per Academic Level Can use part. Work Authorization: -Intended to provide work experience in the U.S. in a field related to your major -May be eligible for a maximum of 12 months– generally. Work Authorization for F-1 Students. “Maintaining” status“Maintaining” status F1 Practical TrainingF1 Practical Training. OPT Optional Practical Training. INTERNATIONAL STUDENT FEE As of September 1, 2013 the Office of International Programs has implemented the continuation. Optional Practical Training. 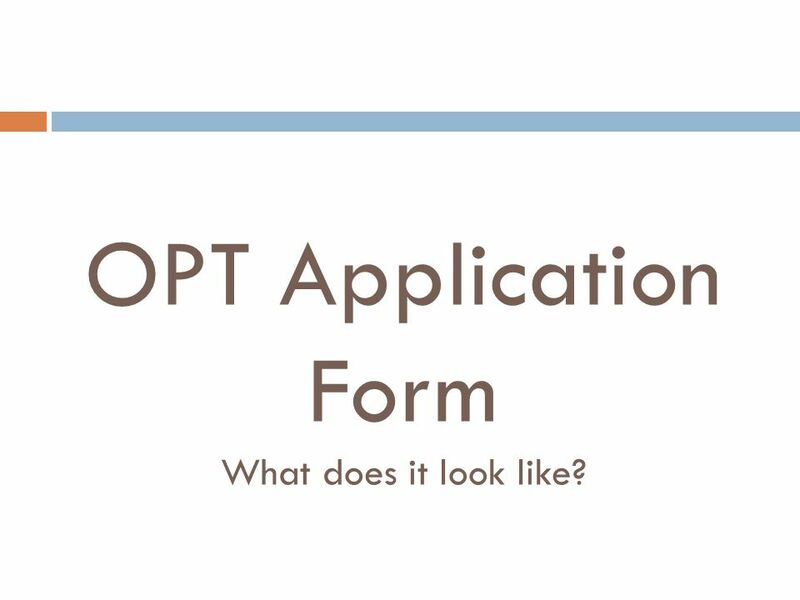 What is OPT? Optional Practical Training (OPT): Temporary employment that is directly related to a F-1 student’s major area. International Students WORKING IN THE UNITED STATES.